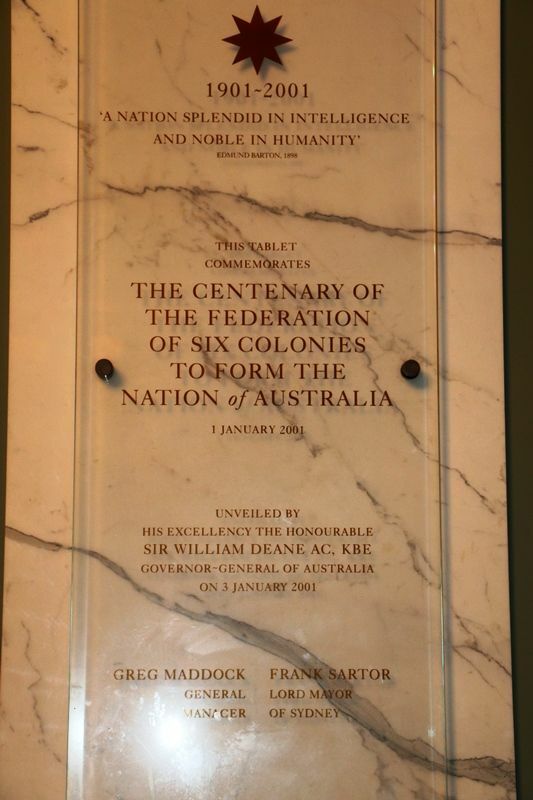 A plaque commemorates the Centenary of the Proclamation of Federation in 1901. On Federation Day, 1 January 1901, the Government of New South Wales hosted a luncheon at the Town Hall to commemorate the swearing-in of Lord Hopetoun as the first Governor-General. It was the Lord Mayor and Council of the City of the City of Sydney, based in the Town Hall, who from the time of the handing over of the Olympic and Paralympic flags at the conclusion of the Atlanta Games were entrusted with the host city protocol and celebrations.